Instead of babbling about art tonight, I’d like for everyone to gather ’round and absorb a bit of the serenity that often floats through the I Can Do This sessions. Peer over our shoulders and experience the essence of calm! Ahhhhhhhhh! Do you feel nice and relaxed? There’s magic in art, but you won’t find it unless you pick up that pencil or brush and take a timeout for art! Little by little, the painting came to life! Bloggers John and Mary McDonald share his and hers Timeout posts each week! Mother and Son (Maruja y Cesar) disconnect from work for a painting session! Thanks, everyone, for your discipline and willingness to share your weekly Timeout sessions, even when I am silent. After a brief stop back home to unpack and repack, I will again be in travel mode at sunrise. Tomorrow night I should have dependable internet and a few hours to focus on my WordPress family! 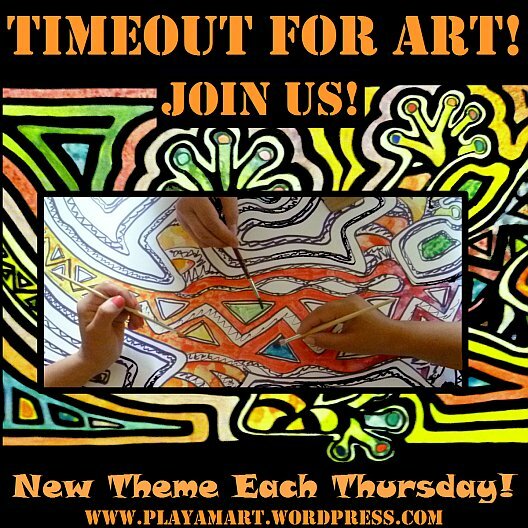 Timeout for Art – A Badge of thanks for round-the-world support and dedication! Feel free to display this badge on your site and/or on your posts. Michelle gave some great pointers in this past week’s Daily Post advice about blog events. See the diverse list of events on the WordPress Daily Post ! Thanks, Michelle, for organizing the events and inspiring us! after a 12-hour sleep, i am joining the world of the living! batteries are recharged, and there’s a full day waiting. you both did a GREAT job w/your individual posts for TIMEOUT. you’re AMAZING! Thanks, Hugh! I’ve a few more days before I’m semi up to the present, but at least my travels reached an end yesterday. i look forward to seeing what i’ve missed! Serenity… thank you, Z….really needed that! thanks amiga.. have you ever visited ecuador? too bad rates are usually high.. i think you’d enjoy a visit… put that on your back burner.. This is just the calm I needed! Thanks for the reminder! i tried commenting two nights ago from my brief stop at home, and most of mine did not go through. one to you was one of those duds! lo siento, i hope to get there soon. How fun this looks. I’m going to have to get to Manta to join you one of these days! after an overnight zero sleep stop at home, i left at daylight for mindo. will be here for maybe a month – will know more soon. Your having a fabulous time and I wish I was there. Thanks for sharing your hearts work, Lisa. It always (truly) BRIGHTENS my day. Those colors POP! thanks! ja, this week has been brutal on my body. 8 hours on one bus, 4 hours on 2 airlines w/terminal loitering in between, a brief stop at home w/zero sleep, and another long trip, i am finally in mindo where i will be for a month. hope to update soon.. i’m glad you enjoyed the post – i was half brain dead when the internet started working to start the post – way past midnight! Once again, safe travels. I’ve just begun painting on the walls. Whoops! No, I can’t. We’re in a rental house. Silly me. But I feel more relaxed already. Your posts tend to do that. buy a sheet of mdf plywood.. prep it, roll two layers of white paint, and you will have a watercolor-paper type surface.. then hold your breath and dive into a painting project! when you move, your art will move with you! oh yes.. but you also need something that smiles at you when you walk thru the door!!!! if you’re happy when you step thru that door, then no, nothing else is needed! True. That’s why we have a lot of art as sculptures, pictures, and objects that we love. Your art certainly has that happy effect on people. sometimes it’s as if a voodoo spell was over them.. painting is very calming to most all young ones. I need to come to your class and get that calming effect. OH HOW MUCH FUN!! You have the BEST IDEAS! thank you! yes, i do have fun, but so do you, amiga, even when things aren’t going well for you. i hope all’s ok? sorry i’m way behind on reading posts and am not sure when i’ll have online time to do so.. will be working on getting a new system for internet very soon. Well do what you can darling! Your the BEST and it’s nice to drop in on you and see all the great things your up to! I posted a story and some pictues will get the badge and put on my blog, I think I will try a mola today so I can say…I can do this! Hope things are better with the ranch and all 😉 saludos amiga! it’s my loss that my life has been so offline and busy with obligations and travel. aftear a 12-hour sleep, i am at least physically recharged. i look forward to seeing your work/posts (all that i have missed!) very soon. congratulations for creating such a wonderful painting community! ah yes; it’s great to witness every soul that floats pigments for the first time!!! Thank you for taking time out for art and sharing all those beautiful people so absorbed in creating their own magic moment. you are welcome! thank YOU as well, especially when i’ve not hopped over to your side of the sea to see what’s happening. just had a 12-hour slumber and feel recharged. the past few weeks have been demanding physically. Ah, serenity! I love your new logo for the Timeout Theme. I’m afraid I’ve been neglectful of my artwork the past few weeks. I’m in a bit of a serenity block. I needed this lovely post to get me back in the groove again. My internet is acting up..I know you understand that issue. My pencil and brushes don’t seem to flow freely and it’s frustrating me. Plus, we’ve had another chayule attack…thousands of minute little aquatic flying insects…flying up my nose, in every corner of the house, and they smell like fish! Not very conducive to serenity. I just need to let go and let live….hard sometimes. wow.. that lake unleashes some strange demons! that does not sound fun at all! we all need ‘down time’ where we incubation time… it’s like kneading bread dough – it starts resisting w/o those intervals of rest between sessions! enjoy your time to read, garden/pull weeds!, and allow the outside world to slowly filter into your psyche.. when you’re ready, you’ll move forward. I love this post – the images complement the title beautifully. I love how you cast your spell of art and calm over a group of young and old alike! How I would love to be there just once. Thank you for sharing the magic with us, Lisa. Hi Lisa I have taken timeout for art this week, the cats have inspired me.